Website and processes: 25 Apr 16 liz, 4/5 Good "Quick and easy to use"
This voucher entitles you to THREE Aerotow launches (flight duration 15 -30mins). An exhilerating experience of silent flight. See Belvoir castle from the air. Chance to take controls. Don't forget your camera. friends/family welcome. Gliding is one of the most exhilarating ways of getting in the air. The sensation of almost silent flight is an unforgettable experience. On arrival you will receive a pre-flight briefing before being shown how to get into the aircraft, this includes safety; use of parachute; instrumentation etc.etc. You will be strapped into the cockpit.The glider is attached to a Robin Tug aircraft by way of a tow rope and on the giving the 'all out' signal the Tug will tow the glider to a height of 2,000ft. The tow is gentle with the glider mimicking the tow aircraft as it climbs smoothly to its release height the tug pilot searching for areas of thermal lift as he climbs. At release height the instructor will detach the glider and start searching for thermals. Each flight duration approx 15/30 mins. Time in the air will be affected by the presence or otherwise of thermal activity within safe 'hunting' distance. 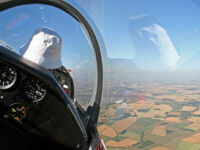 Instructors will demonstrate the effects of controls instruments and 'circuit' procedures. You will be encouraged to take the controls under the direction of the instructor when safe to do so but if you prefer to just sit back and enjoy the flight and let the instructor do all the flying that is fine. We have no specific provision in any of our aircraft for disabled persons but as a guide if you can get in and out of the bath unaided you'll probably be able to get into a glider. Compact cameras can be taken on the flight but they must have a secure wrist strap. Our bright modern clubhouse has full disabled facilities. Limited snacks and refreshments are available both at the clubhouse and at the launchpoint at weekends, otherwise tea, coffee canned drinks crisps etc. In Summer bring light clothes, sun hat ,sun cream and sun glasses. In Winter -warm and wind proof clothing. Experience flights include a month's free club membership enabling student to come back and fly at club rates. Maximum weight allowed is 102kg (16 stone). Minimum age 15. Under 18's must be accompanied by a parent/guardian. Please note: booking office is open Weekday Mornings ONLY . Flights available 7 days a week. We will provide a mobile telephone number for our launchpoint whereby you can contact us if the weather looks doubtful on your chosen day. Please ensure that we have a telephone number in case we need to contact you. Students should be in general good health. not suitable if pregnant, or suffer from epilepsy,fits, severe head injury, recurrent fainting, giddiness blackouts ,high blood pressure or heart conditions. If in doubt please check before booking. -We encourage customers to bring family and friends with them - no more than six please. Dogs strictly on leads and children need to remain under parental control. Each voucher entitles one person to participate in this experience. The voucher is transferable, which means that anyone can use it. The voucher remains valid for bookings for 12 months from the date of purchase. Please contact the operator	using the details printed on your voucher to arrange a date for your event. Event takes place at Saltby in Lincolnshire .